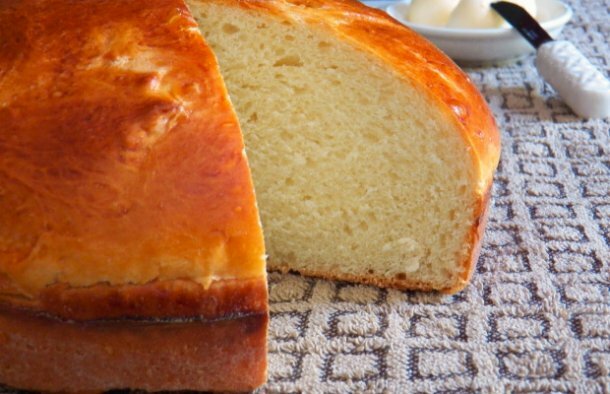 Try this delicious Azorean sweet bread recipe, it does take some time to make it but it is worth the effort. Dissolve the yeast in water and let rise to double in size. Mix all the dry ingredients together, melt the butter and shortening in milk and cool to lukewarm. Beat the eggs and sugar together. Mix all the ingredients together and knead until the dough lifting in the bowl, let it rise for about 6 to 8 hours. Punch down, deflating the dough, form individual breads and put them in buttered and flour dusted pans (any shape or size will do). The dough should fill only half of each pan, so let it rise until the dough doubles in size, filling the pan. For the egg wash, mix the egg with the teaspoon of water and brush the top of each bread. Bake at 160°C or 325°F for 30 to 40 minutes (let it bake longer if the loaves are larger), the bread should be golden brown.